Note: About 10 miles south east of Mount Snowdon , tucked behind rocky passes and elevated clear-water lakes, is the wonderfully serene and scenic ‘Pen-Y-Pass’. With wide trails wrapping around massive mossy basins and jagged rocky caverns, this cinematic trail will carry you all the way to the peak of Snowdon if you so choose, following a north westerly course. Along the way waterfalls cut the mountainsides and streams trickle in the distance. This is a classic Celtic scene, with a minimal amount of forestry, but a wonderful collage of every shade of green imaginable. Reeds drift in the wind, blended with moss and grass on huge knolls and hills that roll, and roll again, in every distant direction. In the heights above cut-boulders and grand shafts of granite slice dramatic angles into the peaks. 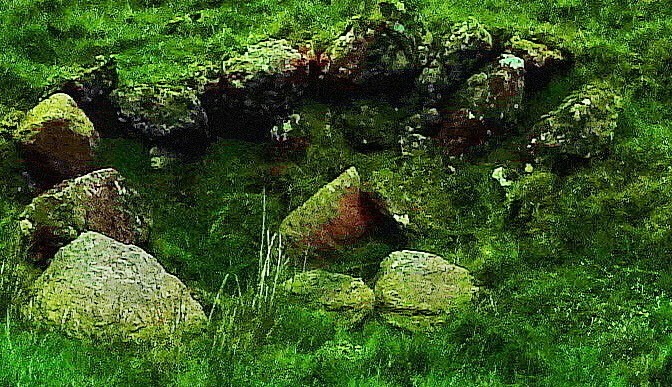 In the valley below, for those who have the eyes to see, are ancient Celtic alters dug into the landscape; Circular stone Cairns with centerpieces that are so old they seem to be almost consumed by the earth, sitting eternally in wait to be rediscovered. 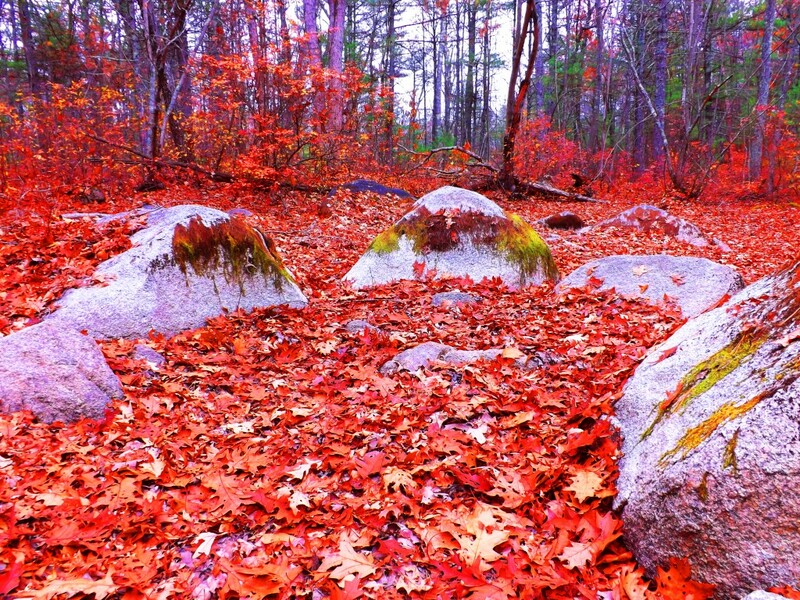 Circular stone alters with centering fixtures of very similar style exist in the forest of Foxboro Massachusetts, although there, they are covered by an ocean of foliage, and equally hard to decipher (An example of the circular alter is shown below, white granite and quartz stones covered by the classic red/orange leaves of New England trails/Please click on photos to look closer). Another wonderful feature of Pen-Y-Pass are the old stone dwellings, most likely of the medieval period, that have been long since abandoned by herdsman and farmers for lack of resources in the valley. The hills of this landscape are huge, with entire sections quarried out and abandoned. Some portions of the quarrying look to have been carried out perhaps no more than five hundred years ago, with less growth upon it, while other massive stones are completely grown over with moss, as if it were done perhaps thousands of years ago. Perhaps Pen-Y-Pass’s most shining quality is the feeling there. The air, when the weather is agreeable, is comfortably cool and clear. Everything you see: mountain, lake, hill, valley, look to be cut from the sky by a diamond. There is an echo in the soft and subtle movements of rams, water, and distant trailblazers. The car-park for this trail is just off the A4086 highway. If you ever come through this valley, do yourself a fantastic favor and plan at least one day to walk the timeless Celtic trail at Pen-Y-Pass, it just shouldn’t be missed. 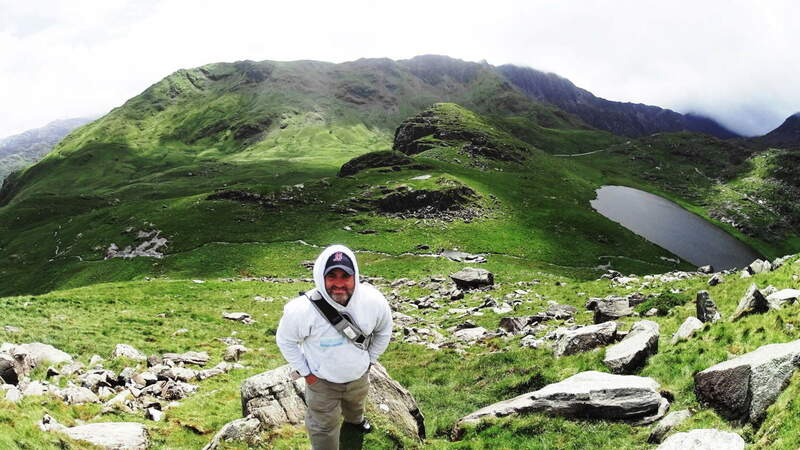 Note: Hiking experiences in the ancient Celtic high country of Wales are, simply put, breathtaking. Snowdonia National Park deservedly hosts a substantial amount of visitors in the north-west portion of Wales, centered around the majestic Mount Snowdon, which is the highest peak in the British Isles south of the Scottish Highlands at 3,560 feet. The history of Wales is interwoven with the preservation of Celtic peoples to its core, known as the last bastion of land that Celtic chieftains would not concede to the invading hoards of Gauls, Visigoths, and Vikings after the Roman withdrawal, circa 410 C.E. The Arthur Legend was born here. This is the very land that King Arthur and his knights defended to preserve the Celtic peoples. 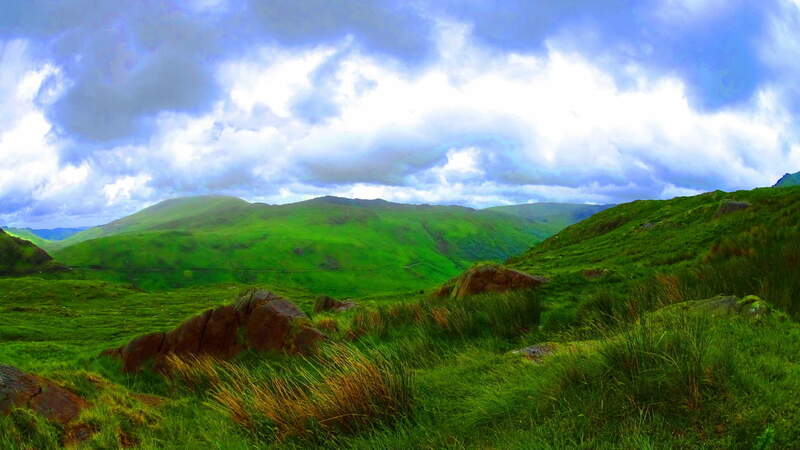 This landscape is the original backdrop for the Knights of The Round Table, for Sir Percival’s search for the Holy Grail, King Arthur’s battling of giants at the foot of Mount Snowdon, and Sir Gawain’s search for the mystical Green Knight, among hundreds of other wonderful tales. The countryside has a time honored mythical history that seems to have always inspired adventurers that reach boldly into the next valley for wonderful and magical zones. 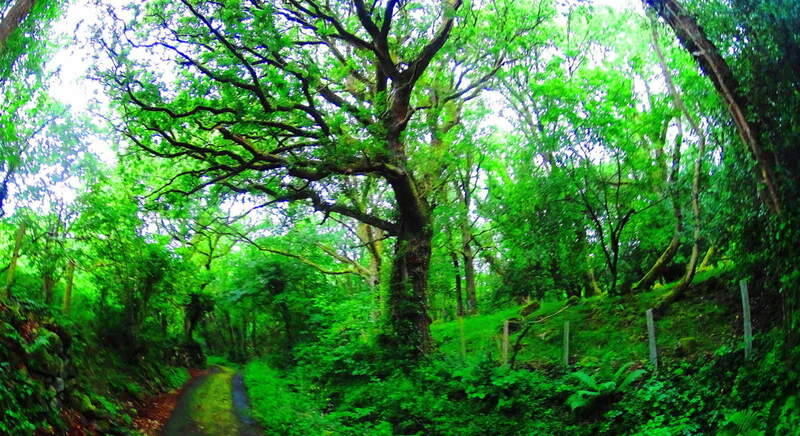 With that in mind, just 45 minutes north of the popularized Snowdonia tourist scene, sits a more conspicuous, but no less beautiful, opportunity for a truly rustic Celtic hiking experience in the serene Conwy Valley. At the top of this valley, above the small medieval town of Rowen, sits one of the most beautiful Dolmen’s in the world, the Maen Y Bardd Dolmen, and the hike to see it is epic. The Legend associated with this particular Dolmen is that of an ancient giant that would toss spears from one end of the Valley to the next, asserting his claim over the landscape, warding off any trespassers. In order to get to the Dolmen a hiker must follow a Roman road that runs beside the spot where it sits today, indicating that this megalith has existed from time immemorial. 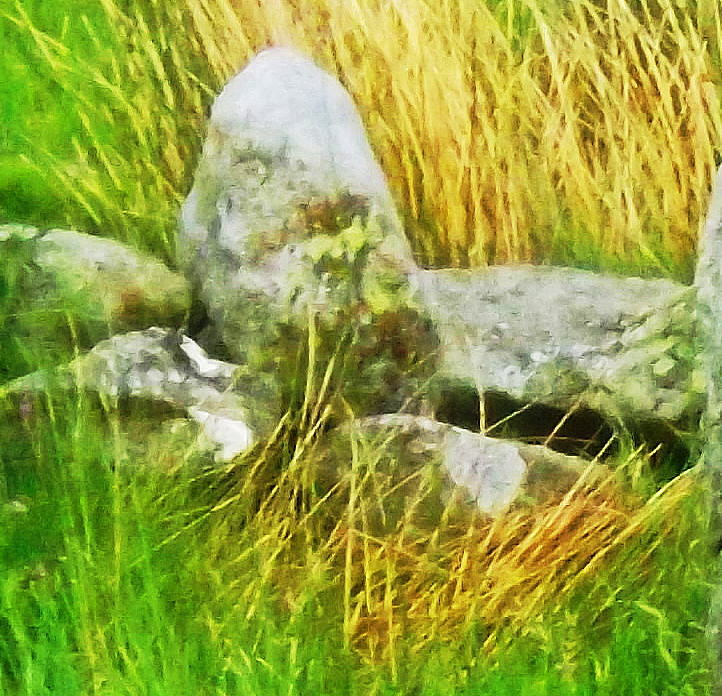 The Roman incursion of Wales took place around 40 C.E, and they were not known for the tender preservation of the opposing culture, yet they obviously let this Dolmen stand as they passed by. I can only think that they themselves saw that the Dolmen was sacred. The Roman’s were certainly aware of megaliths throughout the known world, and they were perhaps the most aware having conquered so much of it. There are Megaliths in Israel, Greece, Spain, France, England, Scotland, and Wales, and the Romans would have considered them. 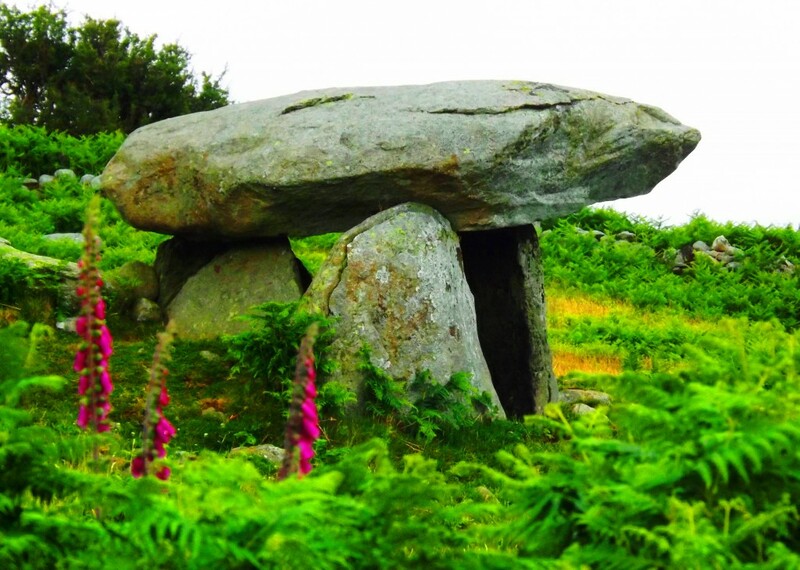 It’s makes sense that they would have known that the Dolmen had stood for perhaps as long as 3000 to 4000 years prior, and they simply did not dare to destroy something so rare, especially if it had no strategic purpose. In terms of ‘era’s’, this is a hike that will take you from the Modern, to Medieval, from Medieval to the Roman, and from the Roman to the Celtic, all in one day. To begin get an early start, and park in Rowen. Head towards the Gwersyll Cefn Cae Campsite road, and pass by it on your right. Continue to follow this road out of town and follow the first farmers-road slightly left towards Parciau Farm. Pass by the last farms on the edge of town to where the road narrows into a country lane, slowly elevating through classic moss blanketed Celtic forest. Push for roughly 1 mile through the trees to get above the tree line, where the path changes dramatically. 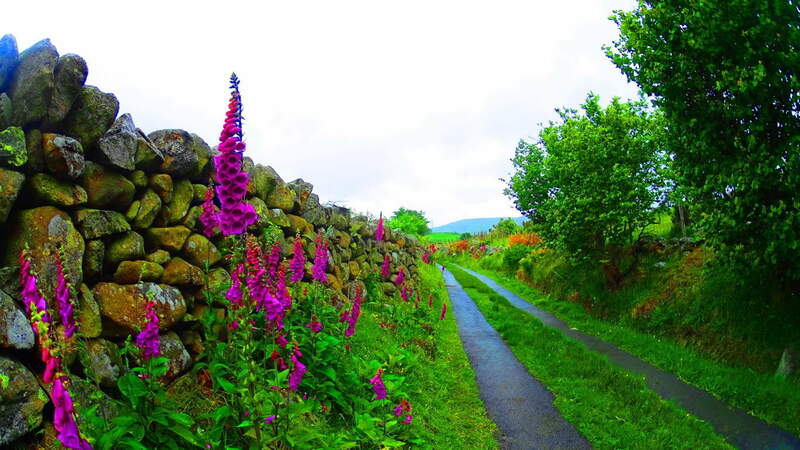 Your trail will become lined with stoic stone-walls and Hawthorn hedges. Knolls and free-standing boulders emerge in every direction. Flocks of sheep scatter and glance from a distance. Fairy Foxglove flowers emerge all around with their striking and small lavender towers. 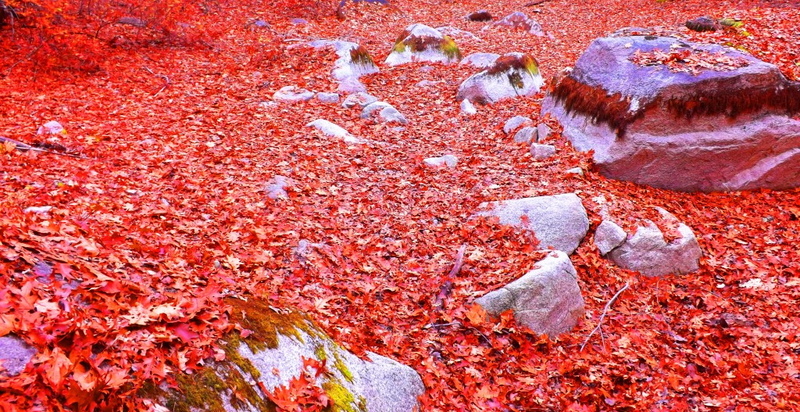 The valley begins to emerge in a beautiful way. Continue for about a mile on this path and you will finally come to an elevated intersection with a panoramic view of the valley. 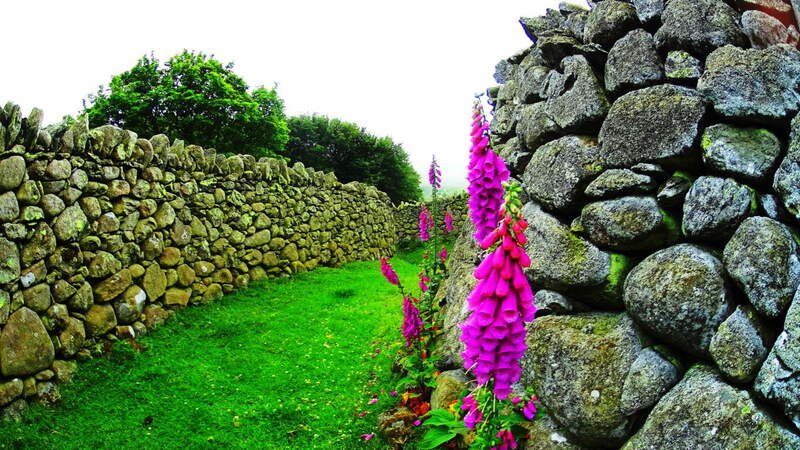 Take the path to the right here, further upward, which is lined with another solid stone wall on your right. You will see, straight ahead and slightly above you, about 1.5 miles away, another road lining the valley above. This is the old Roman road. When you reach this ancient rocky causeway take a right, then follow it for about 1/4 of a mile. On the left of the causeway you will first see a beautiful 8 foot high, 3.5 feet wide granite Standing Stone, roughly 40 yards away. After stopping to appreciate this magnificent stone, continue in the same direction further along the Roman road, and look left again. The Dolmen sits about 50 yards away and can be seen from the road facing the valley below. It is a sight to behold. This is a classic “Portal Tomb” of the same era as the legendary Poulnabrone Dolmen in The Burren Ireland , across the Celtic Sea. 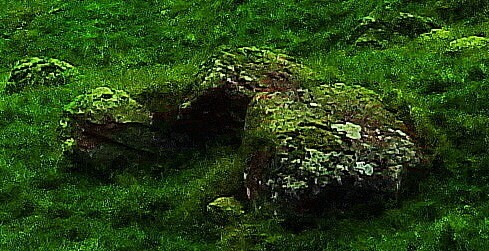 Although it may look somewhat small against the broad valley, a closer look reveals a capstone weighing at least 5 tons. This capstone is directly aligned to a beautiful peak roughly ten miles away across the valley. This is a trait that most Dolmens display: the facing of the most beautiful vantage in the area. This would indicate that whoever built this Dolmen, even in deep antiquity, had a wonderful sense of Beauty, not to mention the engineering skill to build a megalith at a significant, and somewhat secluded, elevation. After finding the Dolmen hikers have several options on the return. You could continue along the Roman road for about 3 miles and veer to the right, back to Rowan, or go back the way you entered. If you return the way you came, just off the trail, there will emerge other standing stones, much more discreet, but no less significant, mixed into the hedges and knolls. This second Standing Stone stood along the long farmers road connected to the Roman road, 30 yards off to the left. Standing about 7 feet high and three feet wide; It looked to weight at least 5 tons. It has a significant curved incision on its right side, and the remaining piece from that incision was set as a fixture behind it, just to the left. 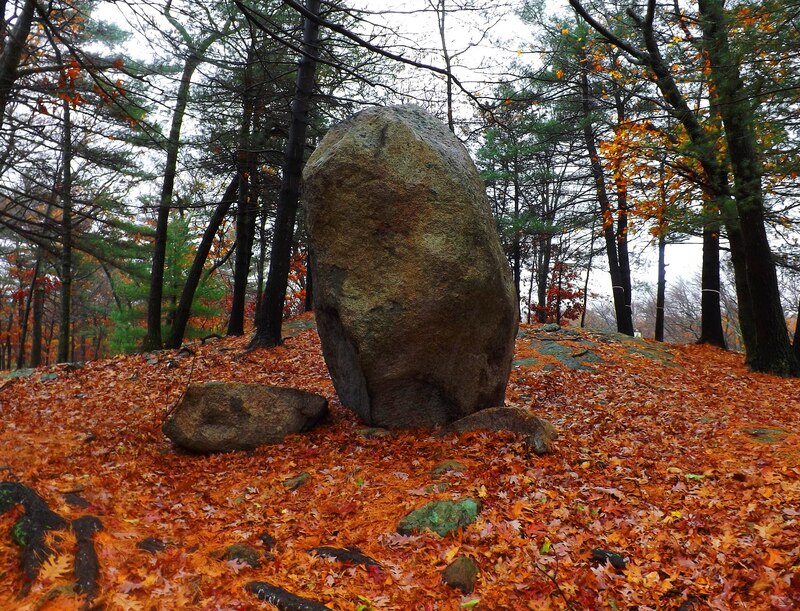 This style can be found at a Standing Stone far across the Atlantic ocean at Lynn Woods in Massachusetts, where cut pieces from the main Standing Stone remain as fixtures in the immediate vicinity (Shown here in the red/orange leaves on the left). Another incredible option for your descent are the stone labyrinth pathways that wind down the valley like something out of a dream. 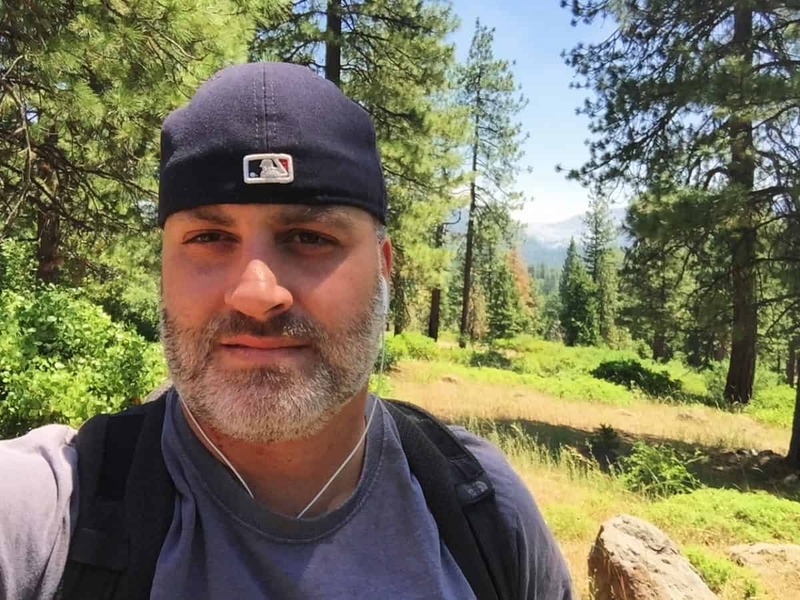 If you choose to explore these options make sure you hike responsibly and mark a fixed point in the landscape in order not to get lost, or even better, bring a compass. The valley is massive; Hiking this high above Rowen there is a good chance that you will be the only individual(s) for possibly five or six miles in every direction. This particular pathway came out near the farmers road that ran down to the forest, just before the farms of Rowen, but be mindful that others exist, and in the valley there are unknown exit points. With all this considered, enjoy the exhilaration of what is obviously a sacred landscape that we know, due to the megaliths it contains, has been appreciated for an incedible span of time that literally reaches back beyond recorded history. This place truly reminded me of a valley in the game Skyrim I love so much. Seeking it out was an achievement born of the inspiration taken from that game, sitting in my room in the dead of winter four months earlier, dreaming of Celtic valleys in Summer. I have to pay it tribute here. If you can dream of these places, you can find them. Seek and find.